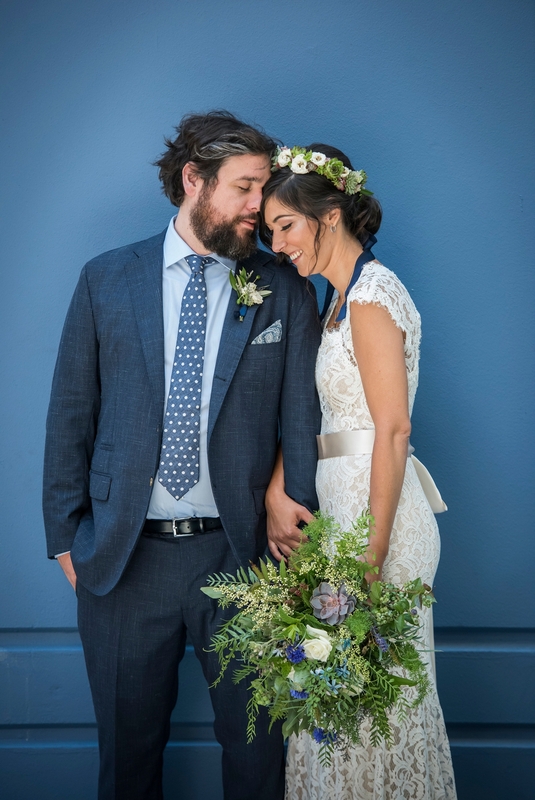 Sarah and Clayton came to me through their wedding planner, Katie, of Wonderstruck Event Design, with a beautiful, Pacific Northwest inspired vision. 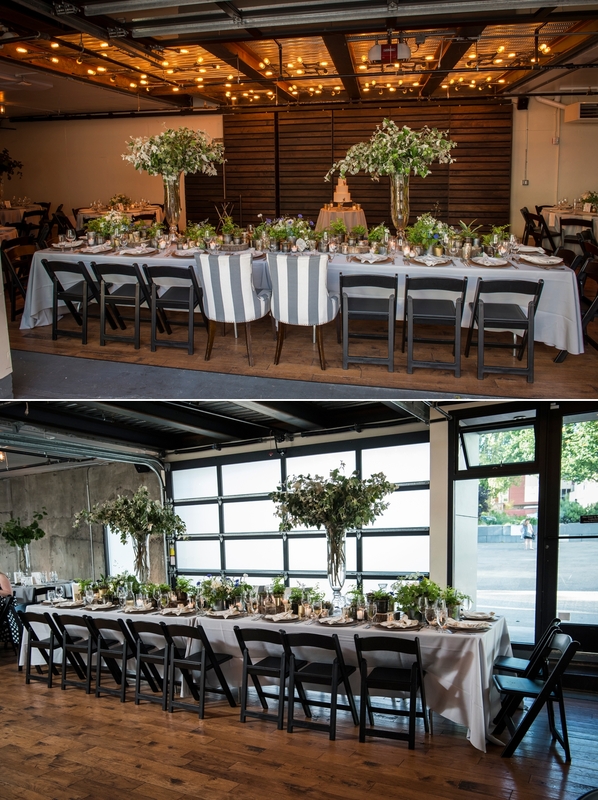 They got married at The Fremont Foundry in Seattle, a former metal foundry and now industrial wedding venue in the Fremont neighborhood of Seattle. It boasts a beautiful rooftop for ceremonies and cocktail hours, for those lucky enough to get married there in good weather. For their flowers, Sarah and Clayton wanted to create a Pacific Northwest forest feel, with lots of potted ferns, potted succulents, and moss. For flowers, they wanted greenery-heavy designs with blue, white, and purple floral accents. We used lots of smaller textured flowers instead of big, bold blooms to keep the bouquets and arrangements feeling wild and organic. Sarah’s bouquet was one of my favorites of the summer! It was wild, organic, natural, and effortless all in one. We used a base of greenery including ferns, pepperberry, mint, and blueberry foliage (with the tiniest, cutest baby blueberries!). To that, we layered wired succulents for added texture and interest. 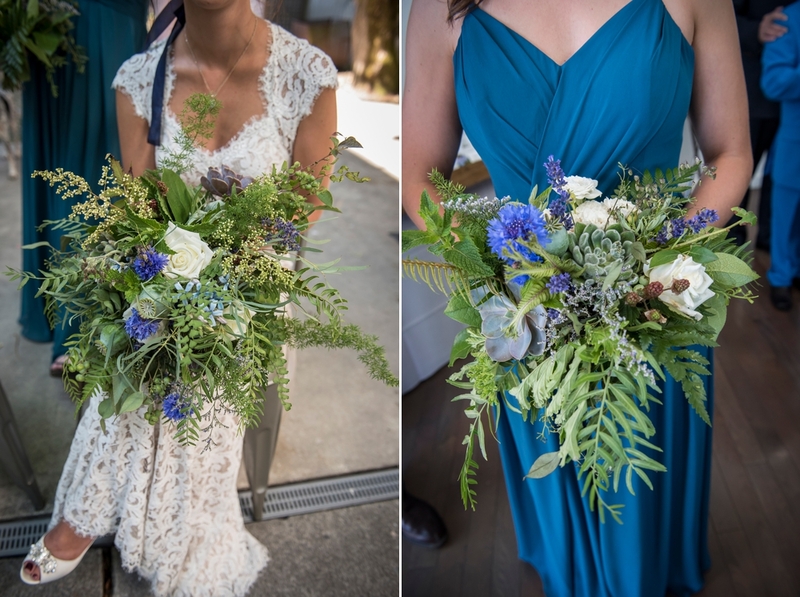 For flowers, we used just a couple white roses, some Wendy spray roses from Peterkort, blue cornflower (also called bachelor’s buttons), lavender, and tweedia. For some extra texture, we included green poppy pods and blackberries on the stem. One of the highlights was making a floral dog collar for their sweet pup! 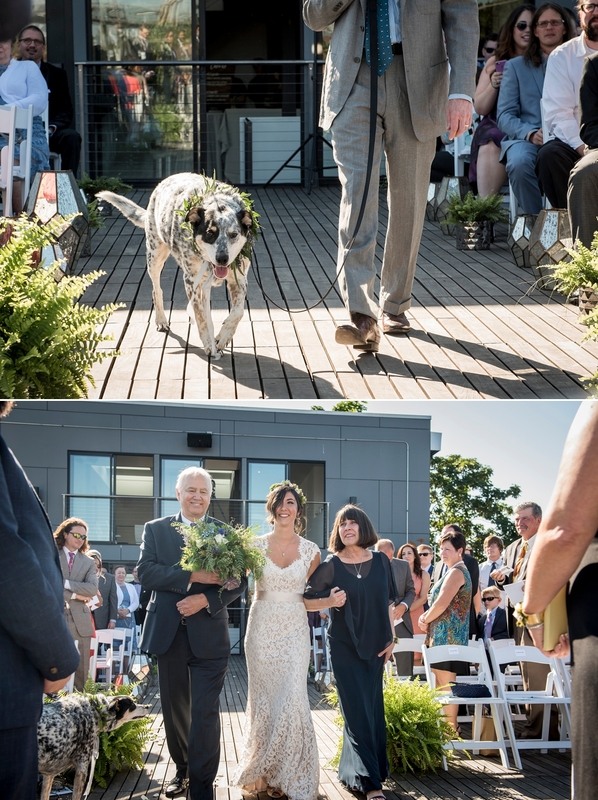 Their ceremony on the rooftop of the Fremont Foundry was under perfect blue skies! We used a driftwood arch and created an asymmetrical design. We started with a base layer of vines, to which we added other textural greenery, and finished with pops of flowers. We used lots of tall delphinium for their dramatic effect! For their reception, we used lots (lots!) of potted ferns and succulents on the head table and around the venue to create a lush, living forest feel. To add height to the head table and a few of the round guest tables, we created tall “tree” centerpieces in glass vases. 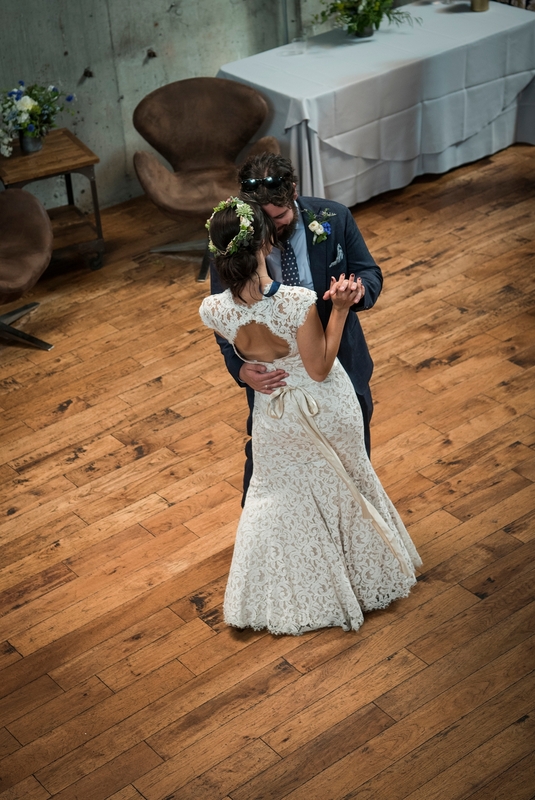 We also got to incorporate Sarah and Clayton’s crystal collection into the design, which added such a wonderful personal touch to their wedding. They continued the crystal motif to their custom GOBO light from Crimson Haze and beautiful (and delicious!) wedding cake by Carla of Honeycrumb Cake Studio. Flowers used: Roses, spray roses, cornflower, succulents, pepperberry, ferns, maidenhair, poppy pods, blueberries, blackberries, lavender, tweedia, mint, delphinium.